Wolf Warrior 2 (Chinese: 战狼2) is a 2017 Chinese action film directed by Wu Jing, who also starred in the lead role. The film co-stars Celina Jade, Frank Grillo, Hans Zhang, and Wu Gang. The film is a sequel to 2015's Wolf Warrior. It was released in China on 27 July 2017. The film tells a story of a loose cannon Chinese soldier named Leng Feng who takes on special missions around the world. In this sequel, he finds himself in an African country protecting medical aid workers from local rebels and vicious arms dealers. 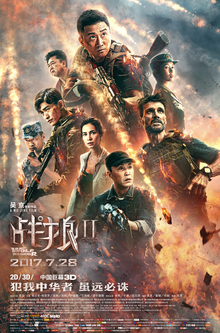 Wolf Warrior 2 received general praise for its patriotic plot, special effects, action sequences and the cast's performances. It was a massive commercial success and has become the highest-grossing Chinese film ever released. The film broke numerous box office records, including the biggest single-day gross for a Chinese film as well as the fastest film to cross RMB 2 billion, 3 billion, 4 billion and 5 billion box office marks. It also became the fastest film to surpass US$500 million and the first film to gross more than US$600 million at the Chinese box office. At a total domestic gross of CN¥5.68 billion (USD$874 million), it is the second highest-grossing film of all-time in a single market behind only Star Wars: The Force Awakens ($936.7 million in North America), and having exceeded North America's totals from Avatar ($760 million), Black Panther ($694 million), and Titanic ($659 million). The film was the seventh highest-grossing film of 2017 at US$874 million, making it the 54th highest grossing film worldwide. It is the first and only Chinese film ever to be included in the list of 100 all-time highest-grossing films worldwide, making it the highest-grossing non-English film of all time. It was selected as the Chinese entry for the Best Foreign Language Film at the 90th Academy Awards. After the events of Wolf Warrior, Leng Feng and members of his special-ops team bring his comrade's remains back to his home town and his comrade's family for his funeral, only to see it on the verge of being torn down completely. A real estate company is pulling down his house and that of his comrade's family during the funeral. The boss of the real estate company confronts them with a gun and sneers at them for presenting the remains to the family, only for the boss to be kicked to the ground. The boss calls on his henchmen to attack them but they are all swiftly disabled by Feng and the other soldiers. Police arrive shortly after and ask Leng Feng to put down the gun he confiscated from the boss. The boss gets back up and boasts that he will "make the family wish they were dead", enraging Feng to a point that he kicks the boss in the stomach, sending him crashing onto the windshield of a police car and killing him. Leng Feng is sent to a military prison for two years and discharged from the Chinese army. After release from prison, Feng leaves for Africa, planning to wander for the rest of his life. While serving as a mercenary providing security on a freighter delivering relief supplies to Africa, he foils an attempted hijacking by Somalian pirates by defeating them in hand-to-hand combat underwater. The freighter arrives safely at its destination. For three years Feng has been carrying a bullet which he found, a clue to the kidnapping of his fiancée, Lieutenant Colonel Long Xiaoyun, that happened while she was on a mission. Feng and some locals are partying on a beach one day when they are attacked by rebel forces aiming to overthrow the government of the African nation. Shortly after the arrival of the Rebels and mercenaries who overrun the government troops, the Chinese fleet arrives to evacuate Chinese nationals caught up in the civil war. While on board, a Chinese shop owner that he helped rescue tells him that the bullet he is carrying belongs to European mercenaries who are helping the rebels. After overhearing guards talking about needing someone to rescue workers at a factory and a VIP, Dr. Chen, who is developing the vaccine for Lamanla, a deadly endemic disease, Leng Feng volunteers. However, he is on his own as no other personnel can follow him while they are on foreign soil without permission from the Chinese military's higher authorities. He travels to the hospital, 60 kilometres away from the dock and enters the hospital building just as Dr Chen is accidentally killed by the mercenaries led by Big Daddy, a ruthless American warrior. With his dying breaths Dr Chen tells him to take his daughter, an African girl named Pasha. Leng Feng and Pasha, along with a female volunteer doctor Rachel Smith, escape the grip of the mercenaries. While escaping, he cuts his hand in a pile of Lamanla infected bodies but shakes it off and moves on. They continue their mission of saving Chinese as Leng Feng also goes to save his godson’s mother, who's working in the Hanbound factory. Upon arriving at the Hanbound factory, Feng is confronted by security and the factory's owner's son, Zhou Yifan, a cocky fuerdai who is also an army fanatic. Big Daddy's mercenaries attack the factory to capture Pasha, thinking she is the one who has the cure for Lamanla. At the factory, Feng tells everyone that the Chinese fleet will be sending a helicopter to rescue them. The women and children will evacuate via helicopter and everyone else will walk to the fleet. Feng with his old pal and Yifan saved the factory crew members from the red scarf members and deadly mercenaries. Feng is about to be overrun when Big Daddy, the other mercenaries and rebels are ordered to fall back. The leader tells Big Daddy that no Chinese can die because he needs China when he is in power, since China is part of the United Nations Security Council. Big Daddy kills the leader of the rebellion and takes over as leader. He orders everyone to go back to the factory to retrieve Pasha and kill Feng. In the factory, Feng chooses to leave as the factory workers learn of his infection with Lamanla. He is injected with a serum for the virus and learns from Rachel that Dr Chen has manufactured a cure using infected patients that survived and developed immunity, and Pasha, who is in fact one of Dr. Chen’s patient rather than his daughter, is the only subject carrying the immunity. Big Daddy and the others arrive at the factory to capture Pasha and kill Feng. They round up the workers and wait for the Chinese helicopter to arrive. Feng arrives with Rachel and Pasha to rescue everyone trapped in the factory. The workers are saved and the helicopter arrives. Pasha and Rachel leave via helicopter, but it is shot down. The battle continues with everyone taking cover. Seeing the massive casualties taking place, the Chinese fleet fire missiles taking out the tanks. Meanwhile, in the battle while confronting Big Daddy, Feng learns that the bullet which killed his fiancée belonged to Big Daddy and, driven by rage over his fiancée's death, kills Big Daddy and saves all the crew members by taking them to UN camps. In the mid-credits scene, Feng is allowed by his commander to return to his military squadron, but is shown in a video that his fiancé Long Xiaoyun is still alive. Wu Jing as Leng Feng, a former Chinese special forces soldier. Celina Jade as Dr. Rachel Smith, a doctor who assists in Africa. Frank Grillo as Big Daddy, head of a group of mercenaries called Dylan Corps. Hans Zhang as Zhuo Yifan, a fuerdai and army fan. His father owns a factory in Africa and he is literally the boss. Wu Gang as He Jianguo, a retired scout who serves as a security supervisor of a Chinese factory in Africa. Yu Qian as Qian Bida, a profiteer. Ding Haifeng as captain in the People's Liberation Army Navy. Oleg Prudius as Bear, a Dylan Corps mercenary and the heavy machine gunner and muscle of the Dylan Corps mercenaries. Heidi Moneymaker as Athena, the sharpshooter and most agile of the Dylan Corps mercenaries. Aaron Ly as Ghost, the driver and the most silent of the Dylan Corps mercenaries. Aaron Toney as Roach, Big Daddy's second in command. The Wolf Warrior 2 continues the storyline of Wolf Warrior. However, as the plot went on, the background of the story is transferred from the Chinese border to the overseas, which helps develop international perspectives. The film was shot on locations in Africa and China between June 2016 and November 2016. For the film's African scenes, it mostly was shot on location in Soweto and Alexandria. The tank battle was filmed in Zhaochuan Ironworks (坤源集团赵川铁厂), Zhaochuan Town of Xuanhua District, Zhangjiakou city, in Hebei province. A promotional poster showed Leng Feng giving the middle finger with the slogan "Anyone who offends China, no matter how remote, must be exterminated." On 16 April 2013, the first draft of Wolf Warrior 2 was completed. In fact, Wu Jing began to write the script as early as four years ago. On 19 June 2016, Wolf Warrior 2 started up in Beijing. Wu Jing spent six months preparing for start up this film. On 23 August 2016, there was one scene that Wu Jing drove a tank alone, rushed through six tanks and crushed a car in the end. In just ten seconds, the car turned into a pile of scrap iron. This is the first time that a domestic actor personally drove a tank into and crushed a car. A car is approximately one tons while a tank is around thirty-five tons. On 2 November 2016, Wolf Warrior 2 was eventually successfully completed after five months of filming. The film was released in China on 27 July 2017 in MX4D, 4DX, 3D and China Film Giant Screen. An IMAX version was released on 18 August 2017 and has gone out in IMAX 2D. The film was released in Sri Lanka through Madhu Entertainment with English subtitles. It was also released in South Africa with English Subtitles through Ster-Kinekor on 10 November 2017. Wolf Warrior 2 became a huge commercial success at the Chinese box office, and also in countries such as Australia and Malaysia where there were reports of sold out tickets. The film was noted for showing incredible legs at the box office despite being a tent pole movie earning seven times its prequel and five times distributor's initial estimates. It topped the international box office for all major films on three separate occasions – in its first three weekends. Its unprecedented success has been attributed to various reasons such as its patriotic subject, nationalistic themes, and its bona-fide action sequences and stunts that have been said to be a breakthrough for Chinese films. The film was also released during the annual summer "blackout period" in which foreign movies are not released, and it only had to compete with other domestic movies. It became the highest-grossing film in China after just twelve days of release, overtaking The Mermaid which held the record for eighteen months. However, the records that the film broke were not just limited to its domestic market. It also became the biggest film released in a single territory in 2017, breaking Beauty and the Beast's record of US$504 million and the biggest summer release of the year in a single territory, ahead of Wonder Woman (US$400 million). As a result, it became the tenth film to earn over US$500 million in a single territory and the sixth film to make over US$600 million, and the third film to pass the US$700 million threshold following Avatar and Star Wars: The Force Awakens. It is also the fastest film to reach the CN¥2 billion, CN¥3 billion, CN¥4 billion and CN¥5 billion marks in China, doing so on its eighth, eleventh, seventeenth and twenty-third day respectively and became the first film to earn more than CN¥200 million (est. US$30 million) for twelve consecutive days globally (tied with Star Wars: The Force Awakens). It has so far grossed a total of CN¥5 billion (US$716.5 million), which includes online ticketing fees, or around US$768.5 million with online surcharges and is among the top 100 highest-grossing films of all time, unadjusted for inflation. Due to the film's rising popularity and strong holds, analysts believe the film could end up making CN¥5 billion (US$747 million) to CN¥6 billion (US$895 million) at the Chinese box office alone. It opened in China on Thursday 27 July 2017, across 19,000+ screens, occupying 42% of the nation's total screens and earned CN¥212 million (US$31.4 million) on its opening day. Including previews, the total stood at CN¥313 million (US$46.4 million). After four hours of advanced screenings Thursday evening brought in CN¥100 million ($US14.9 million) in ticket sales, phenomenal word-of-mouth quickly grew and made its way to the social media. This resulted in the film posting an opening of CN¥975 million (US$144.5 million) – or CN¥921 million (US$136.7 million) without online ticketing fees – through Sunday, and US$125 million from Friday to Sunday. The latter figure is the biggest three day opening, ahead of The Mermaid which opened to US$122.3 million in the same number of days. This made it the top film released that weekend worldwide, even ahead of Christopher Nolan's Dunkirk. As a result of excellent reviews and strong word-of-mouth, the film's Sunday take rose 15% from Saturday's, a rare feat in a country where the biggest films are usually the most front-loaded. Also, its Sunday-Monday drop was just 35% and the screen count rose from 19,000+ to 24,000 (52%). On Monday, it made CN¥279 million (US$41.5 million), a fall of just 35% from its Sunday take and registered the biggest Monday ever in a single territory ahead of Star Wars: The Force Awakens (US$40.1 million). This pushed the film past the CN¥1 billion threshold with a total of CN¥1.265 billion (US$187.8 million). This was followed by the biggest Tuesday with CN¥282 million (US$42 milliin), also ahead of Star Wars: The Force Awakens (US$37 million) and the fifth biggest Wednesday with CN¥278 million (US$41.4 million). By Thursday, the film had earned past CN¥2 billion, the fastest film to do so in the least amount of time. In just ten days, the film grossed CN¥2.73 billion (US$406 million) to become the biggest release of 2017 there, surpassing The Fate of the Furious (CN¥2.6 billion) and the second highest-grossing film ever, behind only The Mermaid (CN¥3.39 billion). The film's demand was so strong that it made more in its second weekend than the first. Earning a total of CN¥1.092 billion (US$162.2 million), an increase of 30% from the previous weekend, it also set a new record for the biggest ever second weekend in a single territory, surpassing the previous record holder Star Wars: The Force Awakens (US$149 million). The 30% weekend-to-weekend hike is among the top ten smallest second weekend drop, and the smallest for a non-Hollywood production. The same weekend it passed the CN¥3 billion threshold with a total of CN¥3.159 billion (US$470.4 million) becoming the second Chinese film to reach the mark after The Mermaid. On 7 August 2017, it became the biggest ever Chinese film released just after twelve days of release. Similarly, The Mermaid overtook Monster Hunt in February 2016 after twelve days. The film began to shed a considerable number of theatres by its third weekend mainly to make room for new releases such as Guilty of Mind, The Adventurers and Legend of the Naga Pearls, resulting in the film falling by 49% earning another CN¥523 million (US$78.5 million), though still maintaining the top spot. Twenty five days after the film's release, it surpassed Avatar to become the second highest-grossing film in a single-territory and is behind only Star Wars: The Force Awakens. It topped the box office charts in China for four consecutive weekends, or a record breaking thirty consecutive days. It was eventually overtaken by French film Valerian and the City of a Thousand Planets on its thirty-first day. At that time, Valerian played 78,000 times while Wolf Warrior 2 was still screened 32,500 times. The film sold 159 million tickets at the Chinese box office. In China, Wolf Warrior 2 received praise for its patriotic plot, special effects, action sequences and the cast's performances. On Douban, the film scored 7.6 versus the previous film's 6.8. On Mtime, it scored 7.5 versus 7. Film critic Zhang Chuan argues that "the movie is a decent Chinese film in visual effects, story telling, and action scenes", and that it is "comparable to its Hollywood counterparts" in terms of these aspects". Wenhui Daily considered the film to be a milestone in the history of Chinese cinema with "stories, connotations, and structures". Due to its patriotic themes and positive portrayal of the Chinese military, it also received high praise from China's state-owned and military-affiliated media. However, the reception is not uniformly positive. Yin Shanshan, a lecturer at the Central Academy of Drama, a top drama school in China, criticized the film as excessively violent and "psychopathic, worthless, without values or logic" on her Sina Weibo account. Internationally, the film received more mixed responses. On review aggregator website Rotten Tomatoes, the film has a 70% approval rating based on 10 reviews, with a rating average of 5.5/10. On Metacritic, the film has a weighted average score of 44 out of 100, indicating "mixed or average reviews". In reviewing the film, The Hollywood Reporter wrote, "The star's charisma is enhanced by his athletic prowess, which makes the hand-to-hand combat particularly arresting, especially a brutal brawl between him and Grillo that provides a fitting climax. The breathless pacing thankfully doesn't allow much time for viewers to ponder the plot holes or worry about character development, although the two-hour running time results in overkill fatigue." Stanley Rosen, a professor at the University of Southern California who studies Chinese society and cinema, said to New York Times, "It's a very individualist personal quest, which is much more of a Hollywood thing. They’re definitely downplaying the Communist Party in favor of patriotism and defending Chinese people and Chinese interests all over the world." Rob Hunter of the Film School Rejects, in his positive review of the film, wrote: "Wolf Warrior 2 still suffers some of the same issues that dogged the first film, but the improvements elsewhere make for a noticeably better and more entertaining action movie. It's a fun movie blending lots of action, some humor, and "feelings" for friends and family, and if the next one improves at this same rate Wolf Warrior 3 is going to be something even more special." In a less enthusiastic review, Noel Murray of the Los Angeles Times wrote that the "blandly generic" film features digital effects that "look fake," but praised its stunts and pointed out "it's fascinating to see a film so closely mimic big-budget Hollywood war pictures, but from an opposing socio-political perspective." The Guardian described the movie as "the undisputed torchbearer for this new generation of [Chinese] patriotic action dramas." Evan Osnos points out how "Wolf Warrior II captures a new, muscular iteration of China’s self-narrative, much as Rambo’s heroics expressed the swagger of the Reagan era." Jonathan Papish from China Film Insider described the tone of Chinese nationalism in the movie as being “definitely a product of Xi’s reign and the idea of [China's] rejuvenation”. A sequel, Wolf Warrior 3 (Chinese: 战狼3), has been confirmed at the end of the mid-credits scene of Wolf Warrior 2. This was later confirmed by Wu Jing. ^ "'Wolf Warrior 2': Film Review". ^ a b c d e f g Frater, Patrick (24 November 2016). "Celina Jade Joins Jacky Wu's 'Wolf Warriors 2' (EXCLUSIVE)". Variety. Retrieved 25 November 2016. ^ "Wolf Warrior 2 (2017)". The Numbers. Retrieved 13 August 2017. ^ Tartaglione, Nancy (6 August 2017). "'Wolf Warriors 2' Chomps $400M+ At Chinese Box Office; Now #2 Movie Ever". ^ a b c Huang, Zheping. "China's top 10 box office hits of all time include four domestic films released in 2017". Quartz. ^ a b c "内地总票房_电影历史票房_中国票房". www.cbooo.cn. ^ a b "战狼2". Gewara (in Chinese). Retrieved 27 July 2017. ^ "'Wolf Warrior 2' Lopes Into Global Top Five - Caixin Global". www.caixinglobal.com. Retrieved 28 August 2018. ^ Tartaglione, Nancy (16 August 2017). "'Wolf' Whistles To $685M; 'Annabelle' Conjures $35M+; 'Spider-Man' Leaps Past $700M WW – International Box Office". Deadline. ^ "China Box Office: 'Wolf Warrior 2' Wins Third Weekend, Marches Towards $700M". ^ a b "All Time Worldwide Box Office Grosses". www.boxofficemojo.com. ^ Mendelson, Scott. "Box Office: 'Wolf Warrior 2' Cracks 100 All-Time Biggest Grossers List". ^ Busch, Anita (22 August 2017). "Universal $3B+ As 'Despicable' Franchise Takes Ani Crown; 'Wolf Warrior 2' Bests 'Avatar' Record – Int'l Box Office Final". Deadline. Retrieved 5 March 2019. ^ Kilday, Gregg (5 October 2017). "Oscars: 92 Films Submitted in Foreign-Language Category". The Hollywood Reporter. Retrieved 5 October 2017. ^ "Wu Jing is filming the sequel of "Wolf Warriors"". ^ "《战狼2》首次探班 渐露冰山一角". 新华网（in Chinese）. Retrieved 8 April 2018. ^ 走进《战狼2》取景地南非贫民窟 铁皮屋里充满危险. ifeng (in Chinese). 4 August 2017. ^ 揭秘《战狼2》"坦克大战"拍摄地：张家口一铁厂内. 163.com (in Chinese). 3 August 2017. ^ Kuhn, Anthony (10 August 2017). "Chinese Blockbuster 'Wolf Warrior II' Mixes Jingoism With Hollywood Heroism". NPR. ^ "《战狼2》历时5个月杀青 从40度拍到零下9度". 腾讯娱乐（in Chinese）. Retrieved 8 April 2018. ^ a b c "犯我中华者虽远必诛". 搜狐网（in Chinese）. Retrieved 8 April 2018. ^ a b c d Nancy Tartaglione (8 August 1017). "'Wolf Warriors 2' Now Highest-Grossing Movie Ever In China; Overtakes 'Mermaid'". Deadline Hollywood. Retrieved 8 August 2017. ^ Ramachandran, Naman (14 October 2017). "Madhu Entertainment Targets Chinese Diaspora With 'Wolf Warriors 2' (EXCLUSIVE)". ^ "Wolf Warrior 2: The nationalist action film storming China". BBC News. 4 August 2017. ^ Addy (5 August 2017). "Wu Jing is China's Next Big Action Star". jaynestars.com. ^ Wu Haiyun (15 August 2017). "How Blockbuster War Movies Capture China's Changing Nationalism". Sixth Tone. Retrieved 17 August 2017. ^ Jonathan Papish (4 August 2017). "On Screen China: Summer Box Office Reignited By Record-Breaking 'Wolf Warriors 2'". China Film Insider. Retrieved 7 August 2017. ^ Fergus Ryan (19 May 2017). "'Wolf Warrior 2' Producers Sued for Alleged Copyright Breaches". China Film Insider. Retrieved 7 August 2017. ^ Patrick Frater (30 July 2017). "China Box Office: 'Wolf Warriors 2' Tops Global Rankings With $127 Million Debut". Variety. Retrieved 7 August 2017. ^ a b Nancy Tartaglione (1 August 2017). "'Dunkirk' Charts $131.5M Offshore; 'Wolf' Devours China; 'Despicable 3' Tops $822M WW + 'Valerian's French Bread – Intl BO". Deadline Hollywood. Retrieved 7 August 2017. ^ Nancy Tartaglione. "China 'Wolf' Howls At $470M; 'Apes' Swings To $148M Offshore; 'Dunkirk' Channels $314M WW – International Box Office". Deadline Hollywood. Retrieved 7 August 2017. ^ Patrick Frater (8 August 2017). "'Wolf Warriors II' Takes All Time China Box Office Record". Variety. Retrieved 8 August 2017. ^ "Flag-waving Chinese blockbuster Wolf Warriors 2 smashes cinema records". The Guardian. 8 August 2017. Retrieved 8 August 2017. ^ Abid Rahman (10 August 2017). "China Box Office: 'Wolf Warrior 2' Smashes All-Time Record With $571M Haul". The Hollywood Reporter. Retrieved 13 August 2017. ^ "DOMESTIC GROSSES". Box Office Mojo. Retrieved 8 August 2017. ^ "Star Wars: The Force Awakens – Daily Box Office". Box Office Mojo. Retrieved 8 August 2017. ^ Scott Mendelson (9 August 2017). "China Box Office: 'Wolf Warrior 2' Nabs Stunning $570M 13-Day Total". Forbes. Retrieved 9 August 2017. ^ a b Nancy Tartaglione (12 August 2017). "'Wolf Warrior 2' Crosses $600M In China; No. 6 All-Time Gross In A Single Market". Deadline Hollywood. Retrieved 13 August 2017. ^ a b Nancy Tartaglione (13 August 2017). "'Wolf Warrior 2' Devours $680M+; 'Annabelle' Conjures $35M; 'Spider-Man' Tops $700M WW – International Box Office". Deadline Hollywood. Retrieved 14 August 2017. ^ Scott Mendelson (21 August 2017). "China Box Office For 'Wolf Warrior 2' Now Bigger Than U.S. Domestic Total For 'Avatar'". Forbes. Retrieved 22 August 2017. ^ Scott Mendelson (14 August 2017). "Box Office: 'Wolf Warrior 2' Cracks 100 All-Time Biggest Grossers List". Forbes. Retrieved 16 August 2017. ^ "WORLDWIDE GROSSES". Box Office Mojo. Retrieved 16 August 2017. ^ Mandy Zou (8 August 2017). "Wolf Warrior 2 beats The Mermaid to become China's biggest ever hit at the box office". South China Morning Post. Retrieved 8 August 2017. ^ Nancy Tartaglione. "China's 'Wolf' Leads Pack; 'Dunkirk' Channels $314M WW; 'Valerian' Crosses $50M Overseas – International Box Office". Deadline Hollywood. Retrieved 9 August 2017. ^ Jonathan Papish (14 August 2017). "China Box Office: 'Wolf Warrior II' Nears $650M, Enters Top Five All-Time in a Single Territory". China Film Insider. Retrieved 14 August 2017. ^ "China Box Office tweet". Twitter. Retrieved 7 August 2017. ^ a b Jonathan Papish (31 July 2017). "China Box Office: 'Wolf Warriors II' Makes Fierce Debut, Threatening to Set New All-Time Record". China Film Insider. Retrieved 7 August 2017. ^ a b c Nancy Tartaglione. "'Wolf Warriors 2' Chomps $400M+ At Chinese Box Office". Deadline Hollywood. Retrieved 7 August 2017. ^ "China Box Office tweet". Retrieved 7 August 2017. ^ "TOP SINGLE DAY GROSSES BY DAY OF THE WEEK". Box Office Mojo. Retrieved 7 August 2017. ^ "TOP WEEKENDS: 2ND – 12TH". Box Office Mojo. Retrieved 7 August 2017. ^ Patrick Frater (6 August 2017). "China Box Office: 'Wolf Warriors II' Earns $161 Million, Becomes Second Biggest Film of All Time". Variety. Retrieved 7 August 2017. ^ "SMALLEST SECOND WEEKEND DROPS". Box Office Mojo. Retrieved 8 August 2017. ^ Patrick Brzeski (21 August 2017). "China Box Office: 'Wolf Warrior 2' Becomes Second-Biggest Single-Market Film Ever After 'Force Awakens'". The Hollywood Reporter. Retrieved 22 August 2017. ^ Patrick Frater (21 August 2017). "China Box Office: 'Wolf Warriors II' Continues Record Run, Extends Total to $769 Million". Variety. Retrieved 22 August 2017. ^ Anita Busch (25 August 2017). "'Valerian' Opens To $9.9M In China To Take No. 1 Away From 'Wolf Warrior 2' – Int'l Box Office". Deadline Hollywood. Retrieved 26 August 2017. ^ Patrick Brzeski (25 August 2017). "China Box Office: 'Valerian' Catches Slight Break With $9.2M Friday Win". The Hollywood Reporter. Retrieved 26 August 2017. ^ "《战狼2》56.8亿票房收官，三个月观影人次达1.59亿". Ifeng.com. Retrieved 3 February 2019. ^ "《战狼2》56.8亿票房收官 累计1.59亿观影人次". Sina.com. Retrieved 2 February 2019. ^ "Wolf Warrior 2: The nationalist action film storming China". BBC News. 4 August 2017. Retrieved 7 August 2017. ^ Huang, Zheping (8 August 2017). "China's answer to Rambo is about punishing those who offend China—and it's killing it in theaters". Quartz. ^ "《战狼2》意淫？影评人驳斥：我们现在能做到". 网易 (in Chinese). 14 August 2017. Retrieved 30 August 2017. ^ "回归内容注重内涵,才是中国电影更有价值的里程碑". 1905电影网 (in Chinese). 9 August 2017. Retrieved 30 August 2017. ^ "Record-Breaking Action Movie 'Wolf Warriors 2′ Takes Chinese Nationalism to a New Level". Global Voices. 11 August 2017. ^ "Chinese Film Critic Feared Fired After Damning Review of 'Wolf Warrior II'". Radio Free Asia. 23 August 2017. ^ Ryan, Fergus (28 August 2017). "Please Allow Me to Dislike 'Wolf Warriors II'". China Film Insider. ^ ""Wolf Warrior 2" : y a-t-il un Chinois pour sauver l'Afrique?". Le Journal du Mali (in French). 21 August 2017. ^ Frater, Patrick (31 July 2017). "China Box Office: 'Wolf Warriors 2' Tops Global Rankings With $127 Million Debut". variety.com. ^ Buckley, Chris (16 August 2017). "In China, an Action Hero Beats Box Office Records (and Arrogant Westerners)". New York Times. ^ Hunter, Rob (27 July 2017). "'Wolf Warrior II' Review: Wu Jing vs Frank Grillo, What's Not to Love?". filmschoolrejects. ^ Murray, Noel (27 July 2017). "Chinese patriotism on display in generic action of 'Wolf Warrior 2'". latimes.com. ^ a b Phillips, Tom (23 September 2017). "China finds its own Top Gun and Rambo in wave of patriotic movies". the Guardian. Retrieved 3 July 2018. ^ Osnos, Evan (8 January 2018). "Making China Great Again". The New Yorker. ^ Frater, Patrick (17 March 2018). "Asian Film Awards: 'Youth' Wins Top Prize From 'Demon Cat'". Variety. Retrieved 17 March 2018. ^ "Hong Kong Film Awards nominations 2018: Ann Hui's Our Time Will Come leads race with 11 nods". South China Morning Post. 6 February 2018. ^ "第34届大众电影百花奖提名名单公布". Netease (in Chinese). 7 November 2018. ^ "《红海行动》斩获百花奖五项大奖 吴京拿下最佳男主角 成龙黄晓明亮相红毯". Mtime (in Chinese). 10 November 2018. ^ "吴京曝"战狼"第三部阵容未定 余男基本确定回归". 网易. 13 August 2017. Retrieved 29 August 2017. Wikimedia Commons has media related to Wolf Warriors 2.